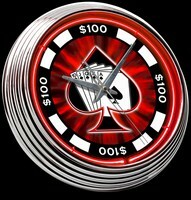 Poker Chip Neon Clock 15"
High quality 3/8" diameter neon glass tubing. Clock mechanism powered via AA battery (not included), 110-volt power adapter to power neon included. Aluminum hands with sweep second hand. Clear glass front never discolors and cleans easily without scratching. Neon tube lasts up to 12 years, even when lit 24 hours a day. 15" diameter, approx 2.5" deep. 6' power cord. Weighs solid 5 pounds. 1-Year Factory Warranty.